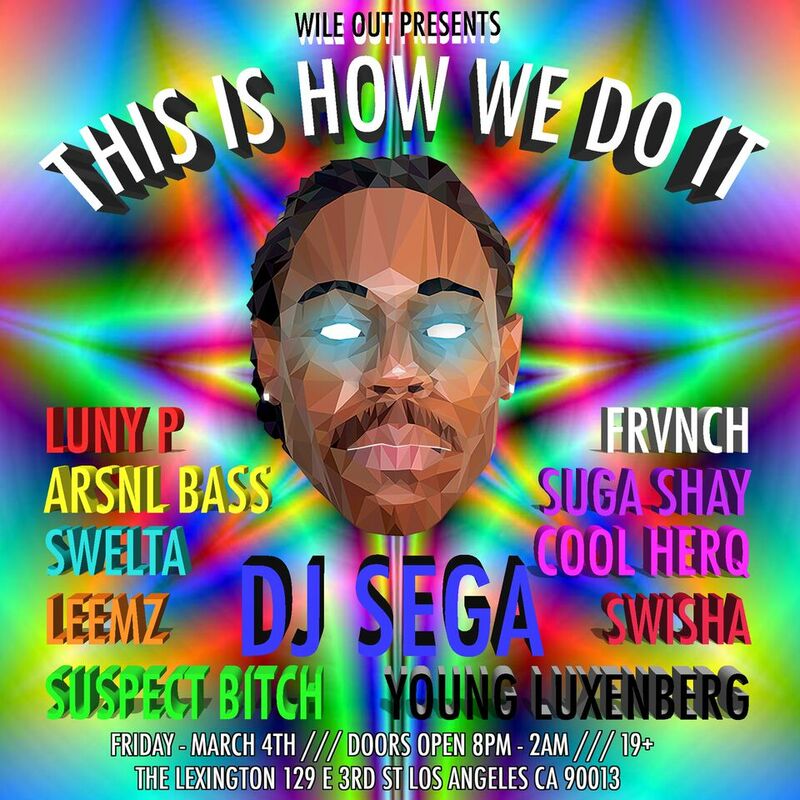 Wile out returns again with another mega show called "This Is How We Do It" featuring the legendary Philly Bassfather, DJ Sega. Wile out recently produced a show in Los Angeles that was nothing short of epic. This time Wile Out is headed to Downtown Los Angeles at The Lexington. The Lineup includes Luny P, Arsnl Bass, Swelta, Leemz, Suspect B!tch, FRVNCH, Suga Shay, Cool Herq, Swisha, Young Luxenberg (Dave Luxe), and DJ SEGA. The amount of Bass music on this lineup is unrivaled in Los Angeles, and we have to thank Wile Out Label head Luny P for creating such an epic party to shake Los Angeles. We got this exclusive track for you guys by Suspect B!tch called "Woke" Click [Download] for that very rare Versace track. That very dark and eerie Bass that has interesting percussions, Bass kicks, and minimal synth usage. The tune has a very Minimal Bass warehouse vibe. DJ Sega recently released an EP titled " A.L.I.V.E. on Wile out that let's you know he's back and bringing the Bass heavy! Young Luxenberg (Dave Luxe) & Cool Herq also put out some new tunes that we expect to hear night of the festivities.